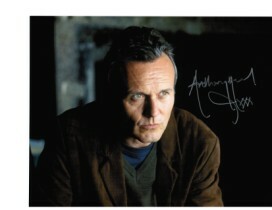 Antony was educated at the London Academy of Music and Dramatic Art (LAMDA). His first role was in the musical Godspell; this led to roles in television on both BBC and ITV, one of his earliest being an appearance in the series Enemy at the Door (ITV, 1978–1980). In the early 1980s he sang with the band Red Box. In the late 1980s, he appeared in a storyline series of twelve coffee commercials with Sharon Maughan for Nescafé Gold Blend. (A version made for the US featured the American brand name Taster's Choice.) The soap opera nature of the commercials brought him wider recognition, along with a part in the Children's ITV comedy drama Woof! Success on the stage and a number of brief appearances on American television, such as in the short-lived VR.5, led to accepting the role of Rupert Giles in Buffy the Vampire Slayer in 1997. For this role he lived full-time in the United States during the late 1990s and early 2000s, although his family continued to live in the UK. Head left the regular cast of Buffy during the show's sixth season and subsequently appeared several times as a guest star. In many interviews at the time, Head said he left the show in order to spend more time with his family, having realised that he had spent most of the year outside England, which added up to more than half his youngest daughter's life. He now lives in Bath, England with Sarah Fisher. They have two children, Emily Rose, born in December 1988, and Daisy, born in 1991.